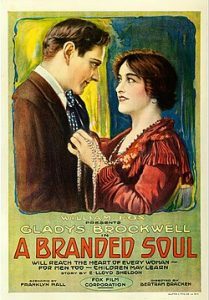 Though virtually unknown today, Brockwell was a popular actress in the teens and 1920s. 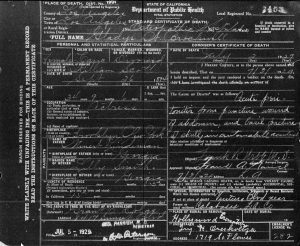 Born Gladys Lindeman in Brooklyn, New York, on September 26, 1894, the daughter of a struggling chorus girl (Lillian “Billie” Brockwell). Brockwell entered show business at the age of 3, with her screen debut for the Lubin Company in 1913. Brockwell was one of the earliest stars at the Fox Studios. 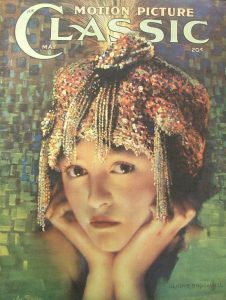 Some of her most important career roles included The Hunchback of Notre Dame (1923), Stella Maris (1925), Man, Woman and Sin (1927), Janet Gaynor’s evil sister in Seventh Heaven (1927), The Woman Disputed (1928), and The Home Towners (1928). Her last film appearance was in Universal’s The Drake Case (1929), which she finished two weeks before her death. On Thursday, June 27, 1929, Brockwell and a friend, Thomas Stanley Brennan, an advertising man, were driving to Ventura in his new roadster. As they neared a curve near Calabasas (about 25-miles northwest of Hollywood, and now the home of the Kardashian’s and many other celebrities), the car skidded to the edge of the road and plunged 75 feet down an embankment, turning over three times when hitting the bottom. Brockwell was pinned beneath the wreckage with one of the car’s doors resting on her face. The couple was unconscious when passing motorists removed them from the wreckage. They eventually were taken to Osteopathic Hospital where doctors diagnosed that Brockwell had received fractures of both lower jaws; fracture of the left upper jaw; fracture of the left collar bone; fracture of a vertebra, a broken pelvis, and a rupture of the large intestine. In addition, the left side of her face was paralyzed, caused by a severed facial nerve. As for Brennan, both of his shoulder blades were broken as well as several ribs. Because their condition was serious, police could not obtain a coherent report of the accident. However, it was determined that neither had been drinking. Once Brennan regained consciousness, he explained that the accident was probably caused as a result of a cinder that blew into his eye just as they reached the dangerous curve in the road. 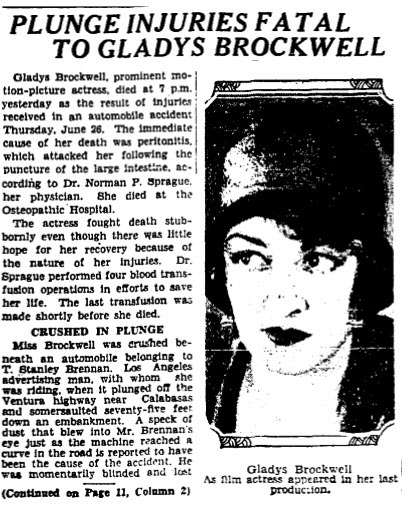 Following a second blood transfusion, Brockwell appeared to improve until perotonis set in as a result of her internal injuries. 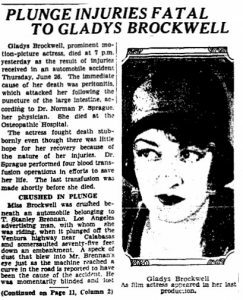 After two more transfusions, Gladys Brockwell died at 7 p.m. on July 2, 1929 at Osteopathic Hospital. The following day, actor Dustin Farnum died in New York. Brockwell’s cause of death was from peritonitis, due to the puncture of the large intestine. No negligence was placed on Brennan, who was still recovering in the hospital. Brockwell’s body was taken to the Ivy H. Overholtzer Mortuary at 1719 South Flower Street. Funeral services were conducted at 2 p.m. on July 5 at the Hollywood Cemetery chapel. The service was in charge of the Christian Science Church in the presence of many prominent film actors, directors and producers. Brockwell was cremated and her ashes given to her mother, Billie Brockwell, who died on January 29, 1949 and was interred at Inglewood Cemetery. 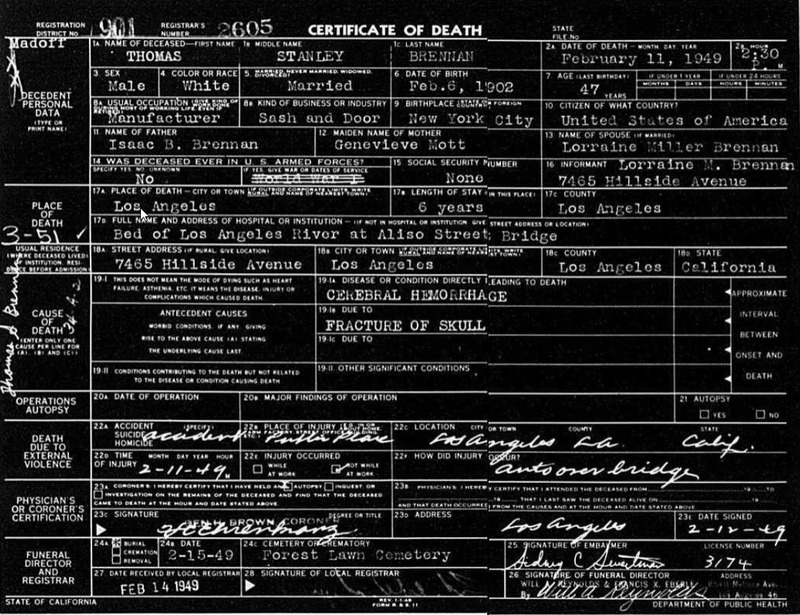 Thomas Stanley Brennan survived his injuries. 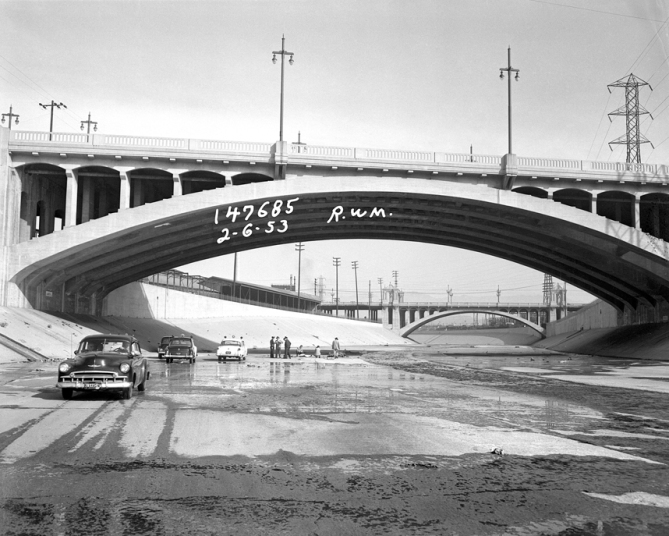 Ironically, almost twenty years later, on February 11, 1949, Brennan was a passenger in a car driven by a friend. 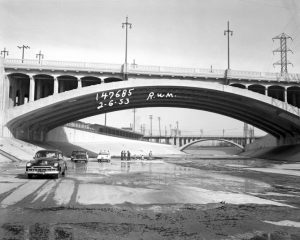 As they crossed the Aliso Street Bridge near downtown, the driver attempted to cut in front of another car when he lost control, swerved across the bridge, smashed through the concrete rail and plunged 35 feet to the Los Angeles River below. The driver survived, but Brennan was killed instantly. He was interred at Glendale’s Forest Lawn Cemetery. This entry was posted on Sunday, November 11th, 2018 at 12:00 pm and is filed under Book/Film News, Hollywood Tragedies. You can follow any responses to this entry through the RSS 2.0 feed. You can skip to the end and leave a response. Pinging is currently not allowed. 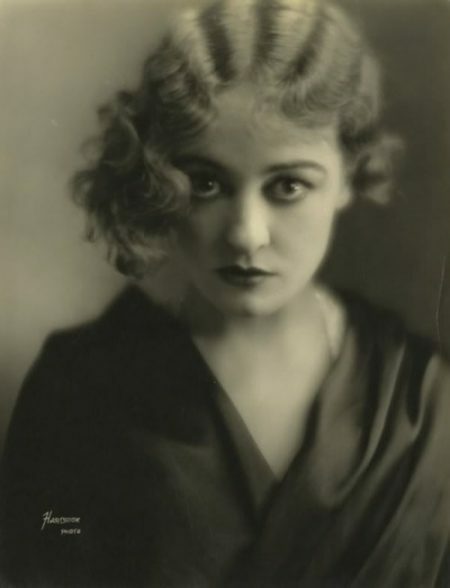 As always, such an interesting post — and loved the photo of her stangling Janet Gaynor. Where do her ashes now reside? Is there any marker at the cemetery for her? Allan, you have a wonderful way of telling a story to keep the reader’s full attention. Hi Steve, I dont know where her ashes are now. 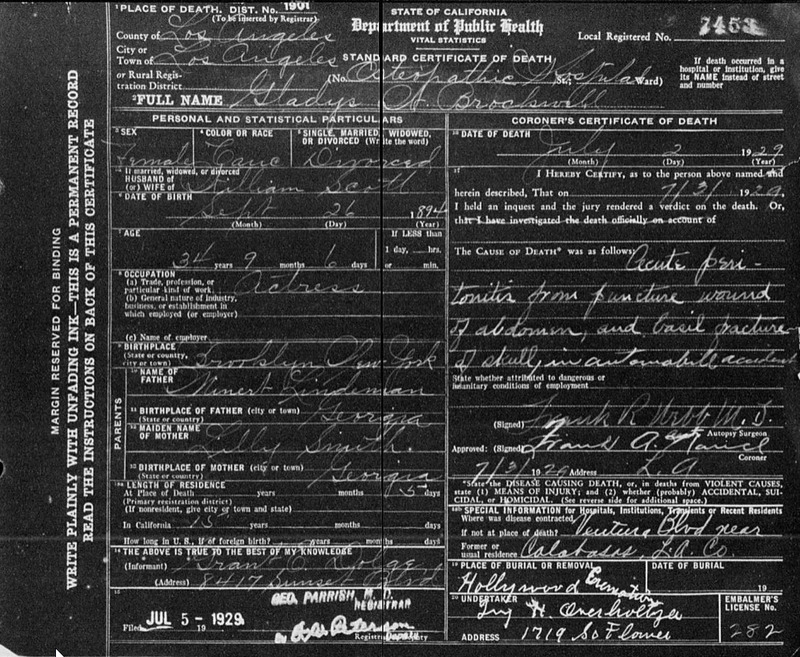 According to the cemetery records they were given to her mother. She may have spread them or they could be with her – wherever she is buried. 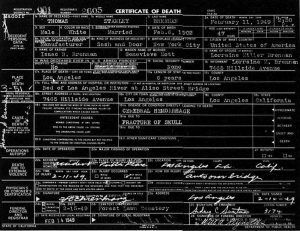 According to the CA death index, her mother, Lillian Brockwell, died on 01/30/1949. Oddly, that was less than 2 weeks before Brennan died, the man who drove the death car. Thanks Mike. 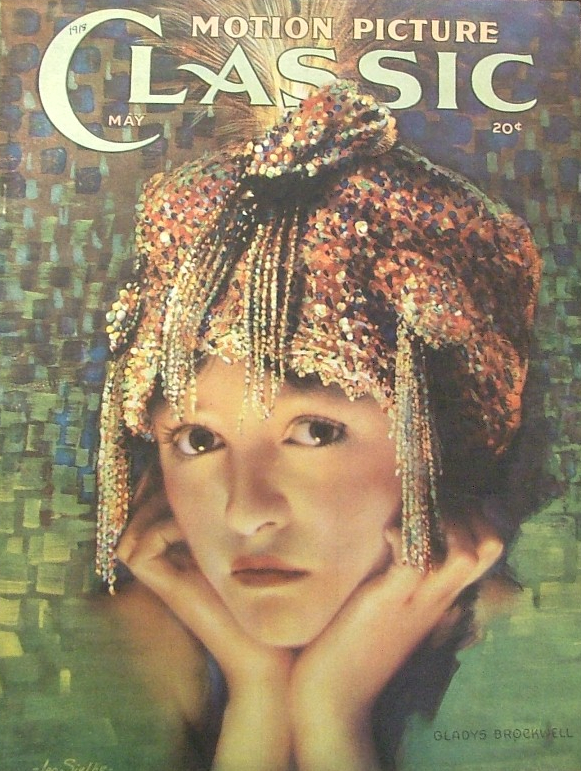 Next week there is a piece on Virginia Rappe by Joan Myers who is researching her life. And following that will be one on Breezy Eason Jr. at Hollywood 4E.